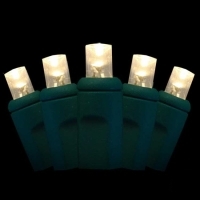 This string of warm white wide angle crystal LED holiday lights from Green Watt has 50 LED lights on the string with 2.5 inch spacing between each bulb. The length of the light string is approximately 12 feet. It has male to female connections on a green wire. Using only 3.5 watts of energy, this light string allows you to enjoy your holiday display without worrying about a significant increase in energy bills. In addition, take comfort in knowing unlike their incandescent counterparts, these LED bulbs remain cool to the touch.